What do you Love about Link’s Awakening? As this series continues, we tackle our second handheld title. This was a very original game, in many ways, even by Zelda standards. It was the first to do many things: Bring the franchise to a handheld system, take place outside of Hyrule, and, most notably, not feature the Triforce or Zelda. However the essential gameplay elements remained: dungeons, bosses, items, exploration, memorable characters and a compelling story. And the one thing that was sorely lacking, color, was introduced in the game’s DX version, released only a few years later. While not one of my favorite Zelda games, I can’t deny that it’s still a stellar title. I can’t put my finger on why I don’t adore this game as much as others in the franchise, but I suppose that’s a good thing seeing as how this article series is supposed to focus on the positive. So let’s do that. Hit the jump to read more! Story has always been a secondary thought to the creators of every Zelda game, gameplay coming first. 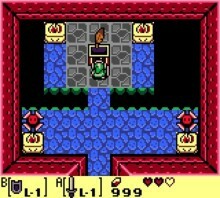 I hypothesize that with gameplay fairly solidified since the NES and SNES titles, the Zelda team took a little more time coming up with a more unique and interesting setting and tale to tell. Don’t get me wrong; there’s nothing wrong with the previous games’ quests of saving a princess and slaying her captor. It’s a formula that works and as such has become quite popular. So for the Zelda team to stray away from this formula and set Link on a personal journey in an unfamiliar land was quite a risk. What we got was not only a great Zelda game, but possibly the greatest story in the lore yet. It pushed boundaries and made us think. By progressing in his quest, Link was coming closer and closer to destroying the people he was helping, and that were helping him. Through the lovely Marin, Link was able to see Zelda, and therefore his rightful place in Hyrule. 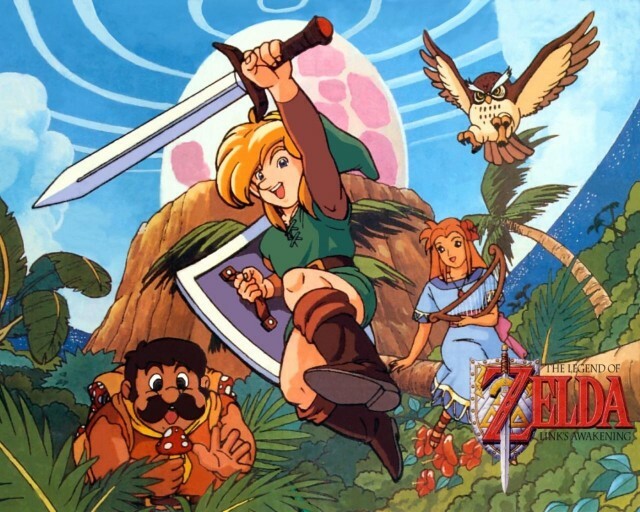 Had this new approach not worked, it is debatable whether or not the Zelda team would have again set Link on an adventure outside Hyrule, which would’ve stripped us of several subsequent and fantastic games in the series. It is by breaking the ties that, on the surface, appear to define Link (i.e. the Triforce, Princess Zelda, and Hyrule) that we actually get to know Link. One of the most notable differences between Mario games and Zelda games is the main character’s ability to jump. 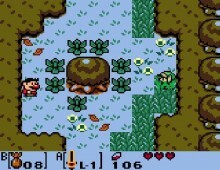 This skill is Mario’s trademark, and Link has been unable to do so in a top down game until Link’s Awakening. 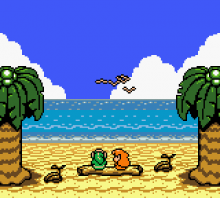 If you prefer side-scrolling Mario games, then Link’s Awakening just may appeal to you. At several moments in the game, you will find yourself in side-scrolling areas, generally underground enclosures and dungeon basements. Though The Adventure of Link utilized this style, these tricky sections feel like something new to the series. They stay true to the puzzle-solving aspect of the series, while paying homage to its cousin Mario (complete with Goombas and Piranha Plants). But jumping is not limited to the side view portions of the game. Once you acquire the Roc’s Feather, you can jump anytime, anywhere. Generally used for leaping over pits in the ground and dungeon floors, I often find that I use the Roc’s Feather as a general default item. For instance, when I do not need a particular item at any time (exploring the overworld), I equip this handy item. It more easily allows you to leap over enemy projectiles and avoid physical attacks. 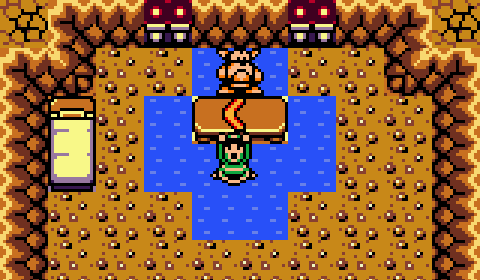 With its return in the Oracle games and The Minish Cap (in the form of Roc’s Cape), it is evident that this useful tool is popular among players and will likely appear in future games, perhaps even a 3D one. On a side note, I feel like this item would be a natural fit for the upcoming A Link Between Worlds. In the game’s first trailer, we saw Link spring toward us after hammering down a switch that shoots him up in the air. Why not grant Link the ability to do so anytime, anywhere at some point in the game? Even if just for the aesthetic appeal, this item’s reintroduction would certainly be a welcome surprise. While more of a series of Easter eggs rather than significant gameplay elements, cameos serve as a touch of surprise and humor for the more devoted fan base. There are quite a few appearances of characters from Nintendo’s most popular franchise, Super Mario. Mario himself (excuse me, Tarin) makes an appearance, and quite a comical one. We’re used to seeing our favorite high jumping plumber gracefully navigating traps and dodging enemies, but here he is reduced to a bumbling raccoon (Super Mario Bros. 3, anyone?). With one whiff of a mushroom (another Mario connection), the raccoon is transformed back into Tarin, and Link can exit the Mysterious Woods. Shortly after this cameo, we are treated to a dog walking mission with a Chain Chomp (or Bow Wow). I know, walking a dog in a video game sounds… well, less than exciting, but here it really is quite fun. This beast will devour any monsters in your path, and it’s a shame that you have to give him up once you enter the second dungeon. Other notable cameos include minor appearances by Yoshi as a doll, and Princess Peach as “Christine” in a photograph. Though ultimately unnecessary to the overall story or gameplay, these cameos at least add a touch of flare to an already great and humorous game, and subconsciously tell us to play a Mario game once we’re done playing Link’s Awakening. Well played, Nintendo. Well played. What do you all love about Link’s Awakening? Do you agree or disagree with the points above? Which game do you want to discuss next? Comment below, and let’s talk about it!